Summary: Our lives become busier with each passing day, and as technology escalates, so does our access to work, obligations, and stress. Constant stimulation and expectation have left us burnt out and distanced from the present moment. 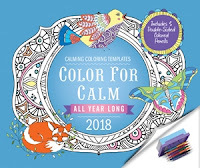 Color for Calm All Year Long 2018 offers over 300 coloring templates all designed to help you get coloring and get relaxed throughout the year. With school starting for both of my kids on Monday, I'm definitely starting to think about fall and football! But it also means that the holidays are right around the corner, and I do like to get a head-start on Christmas shopping. One gift that I always received as a kid (and tend to buy for my own children) is a yearly calendar. The COLOR FOR CALM ALL YEAR LONG 2018 is a really great box calendar that has a different coloring template for each day of the year. Not only can you color a different calming image every day, but this boxed set also includes a set of 5 double-sided colored pencils that attach to the base. The designs by Carrie Stephens are absolutely adorable and guaranteed to give you at least a few minutes of "calm" each day as you color the calendar page... you know, before life gets crazy! I know it's still August, but it's never to early to discover fun (and reasonable) gifts for the holiday season. I just love the COLOR FOR CALM ALL YEAR LONG 2018 calendar, and I think it's both a practical and entertaining gift for the person in your life that needs a little calm in their life... and really, who doesn't need a little calm? Thanks to the publisher for providing a sample of this calendar. I've never finished coloring a page in a coloring book but might be able to handle these small calendar pages.